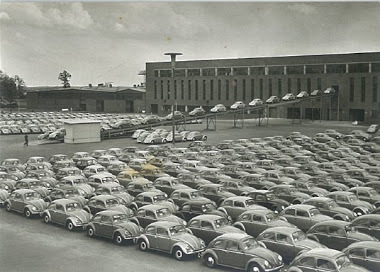 A small number of civilian Volkswagen Beetles were first built just before Germany invaded Poland, launching World War II. 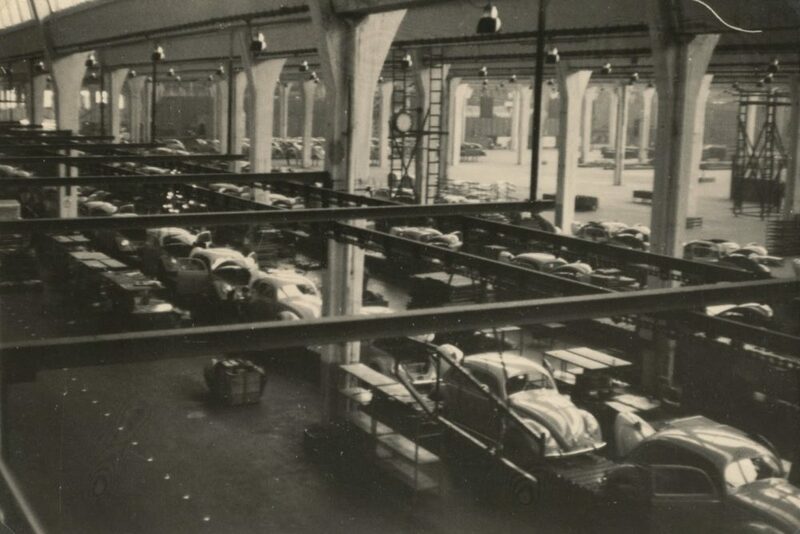 A few more were built during the war, with most examples going to high-ranking Nazi party officials. 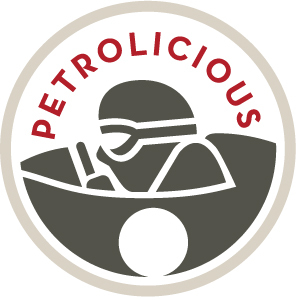 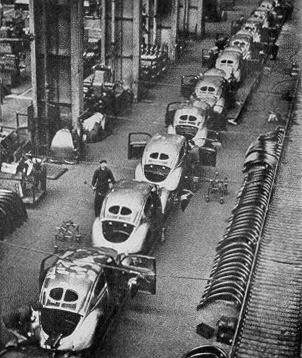 Following the war however (in 1946), production was ramped up to a thousand per month, mostly due to limited materials availability under Allied control. 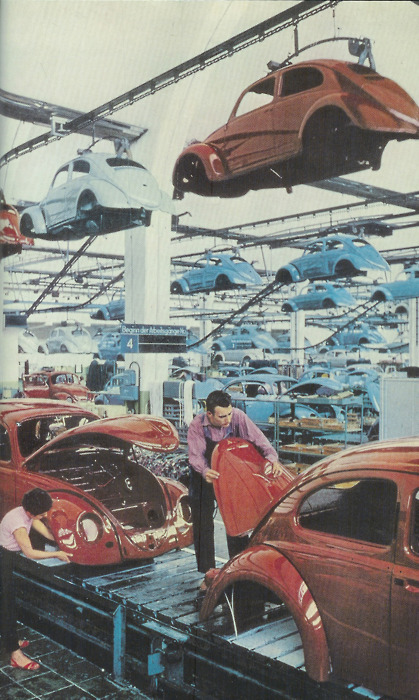 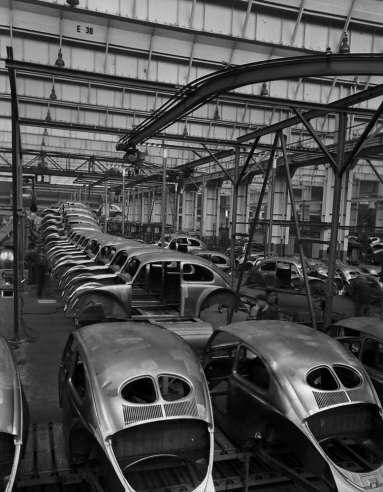 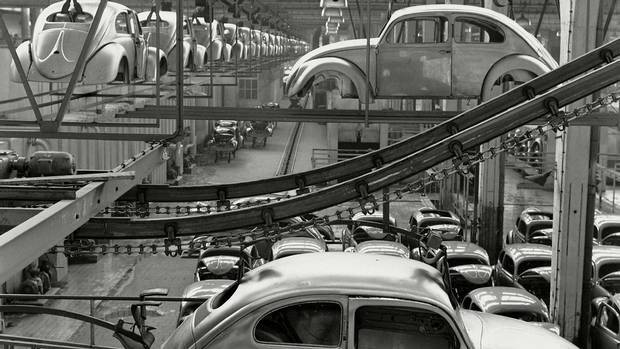 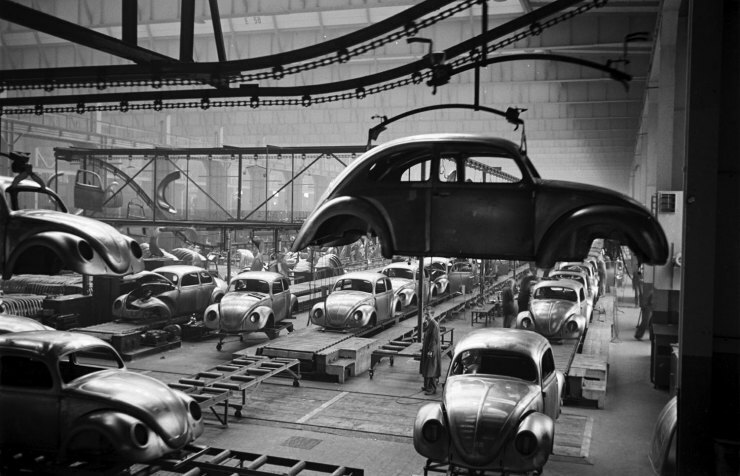 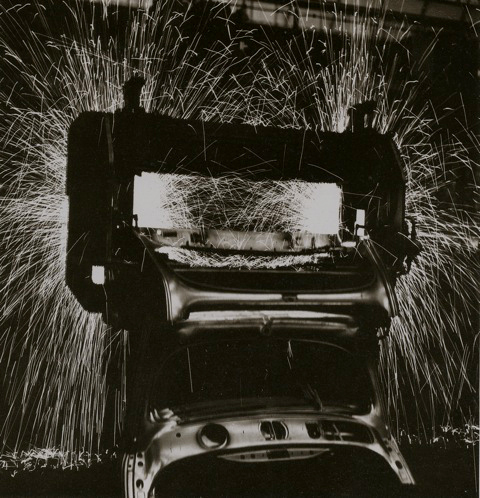 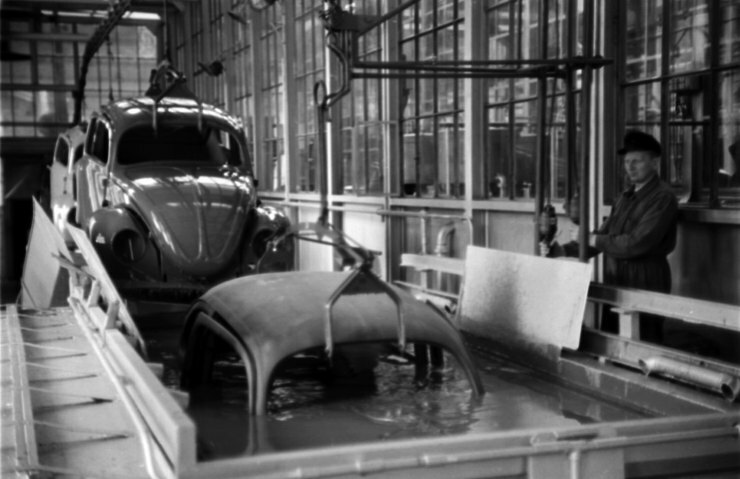 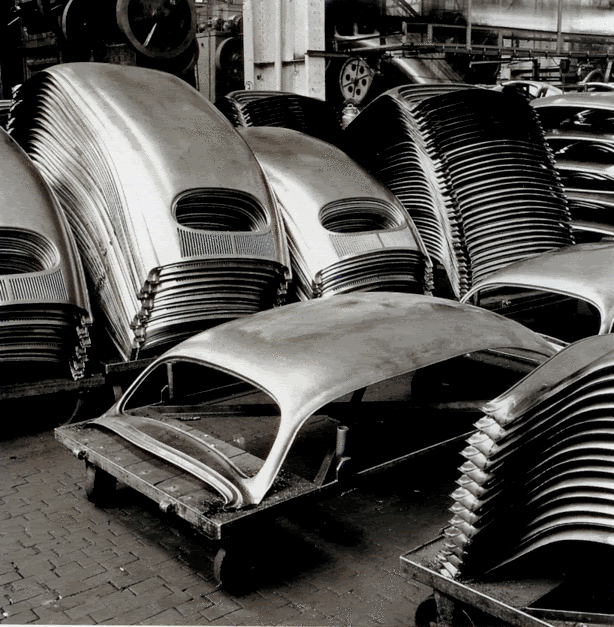 Production exploded shortly thereafter with the one millionth Beetle being built in 1955. 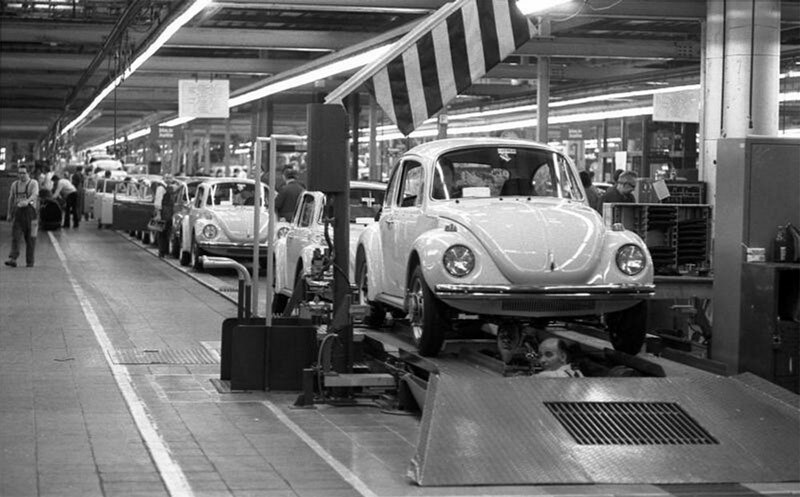 While it wasn’t very popular in the US initially, the explosion in production was fueled by demand in countries with weaker economies (West Germany, for instance). 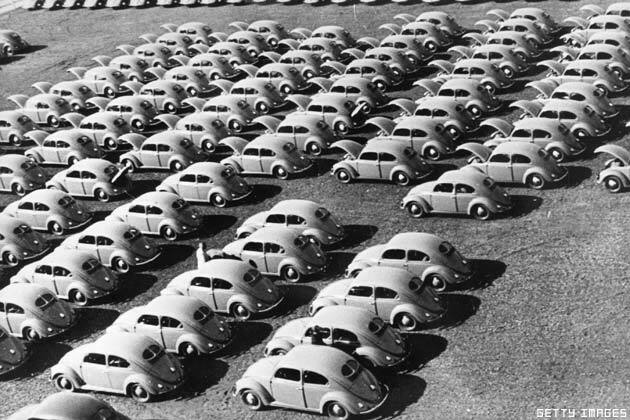 But as we all know the Beetle went on to become the vehicle of choice for those who couldn’t or didn’t want to buy a big, flashy sedan. 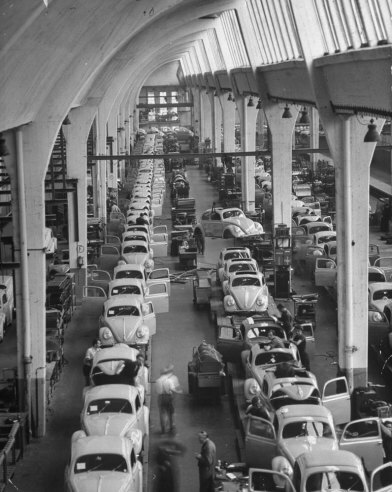 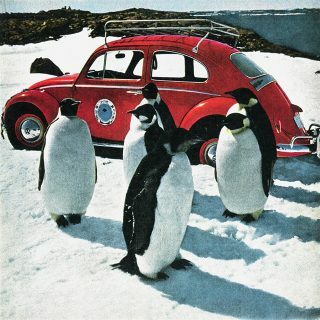 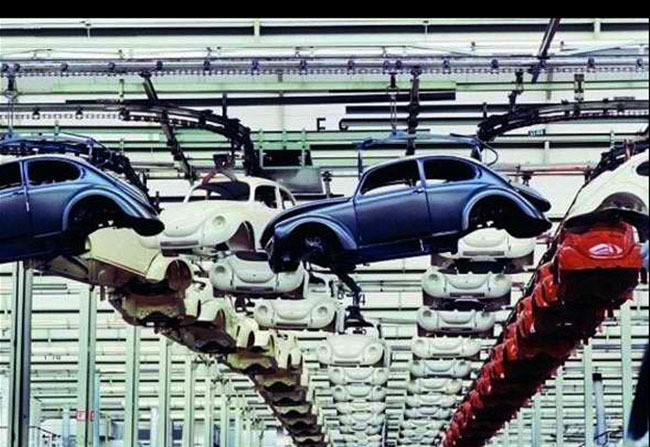 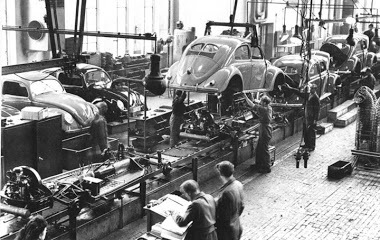 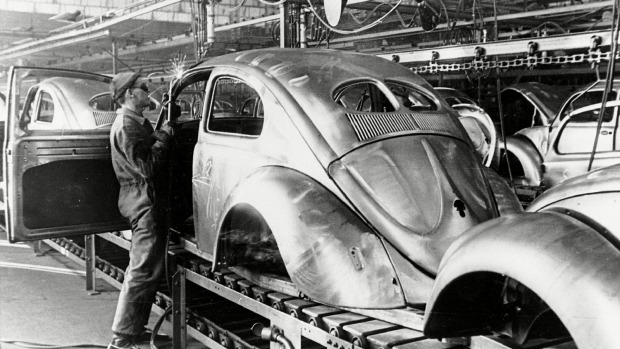 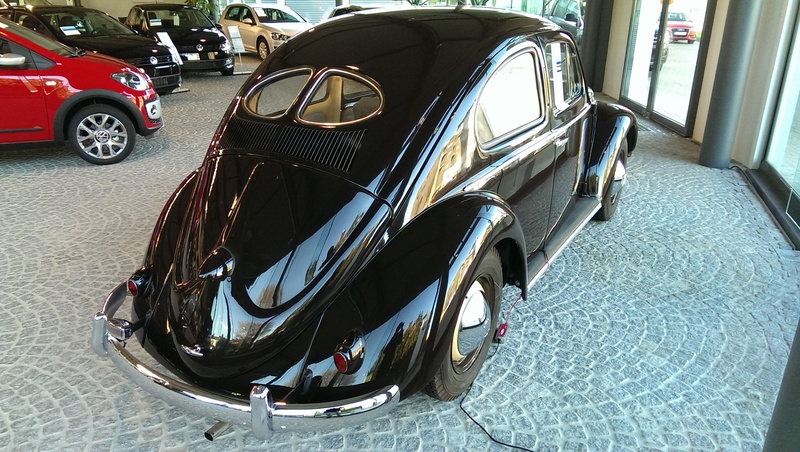 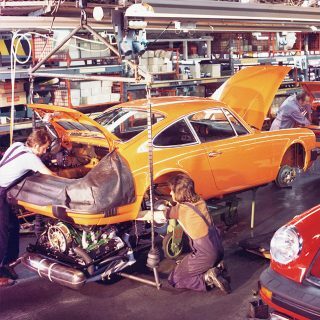 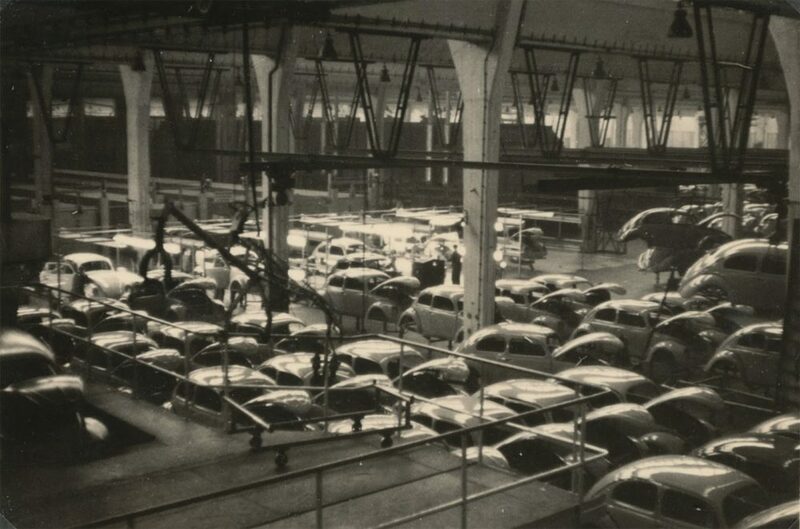 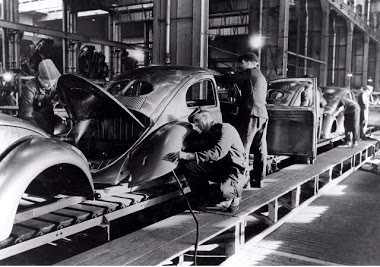 Additionally, Germany wasn’t the only country to build the Beetle as Volkswagen opened factories in South Africa (1951), Brazil (1953), Mexico (1955), and several other nations as well. 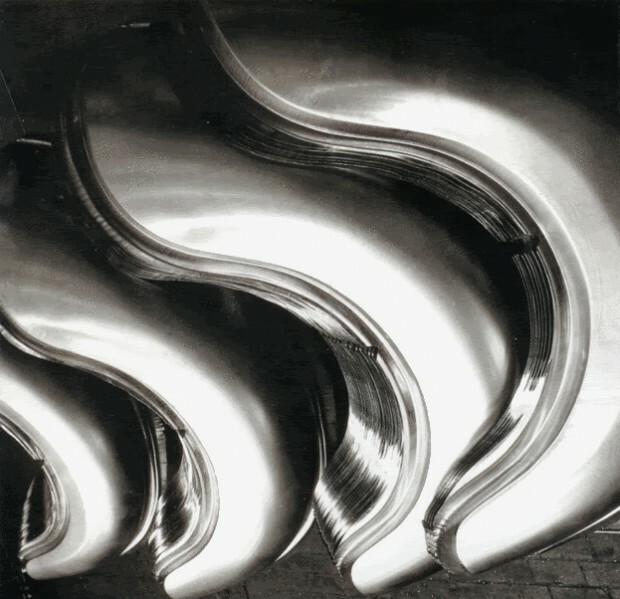 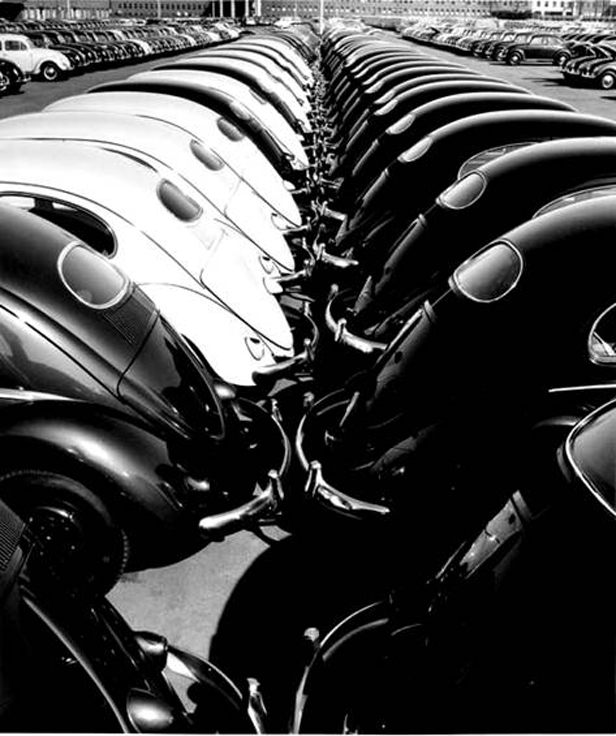 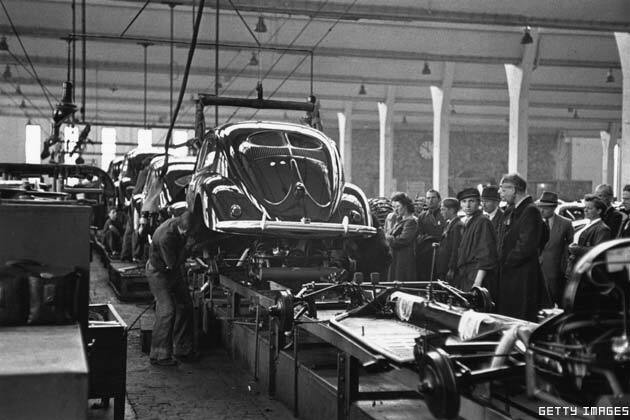 Millions of Beetles were built during its production run. 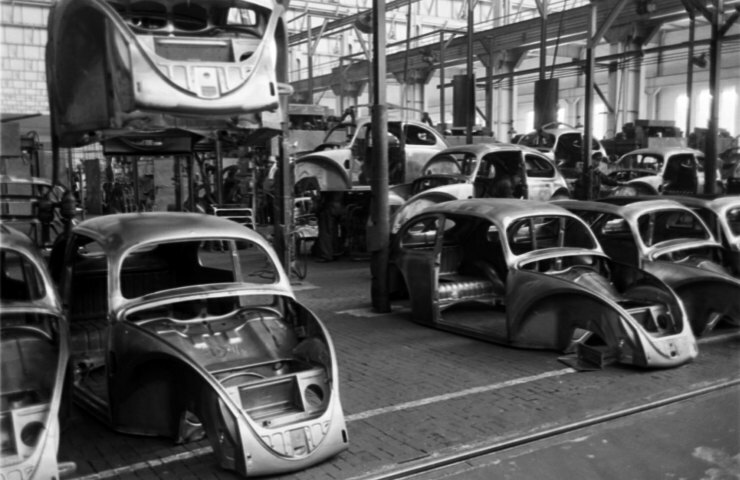 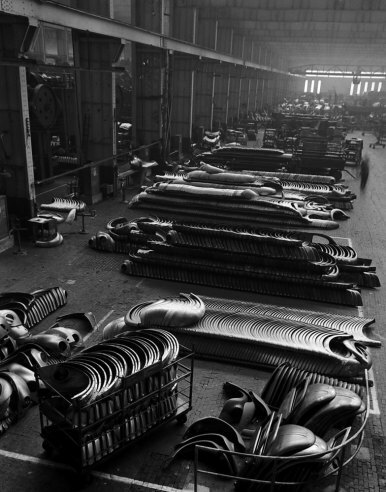 And although production of “The People’s Car” finally ended in Mexico on July 30th, 2003, we can still reminisce and enjoy these shots of the round, geometric Bugs and their stampings being assembled. 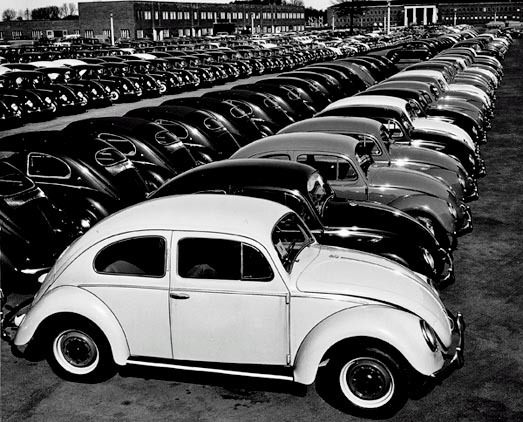 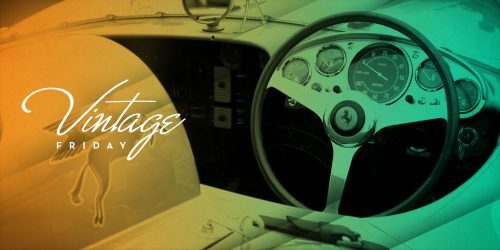 Think of just how many people have enjoyed these cars! 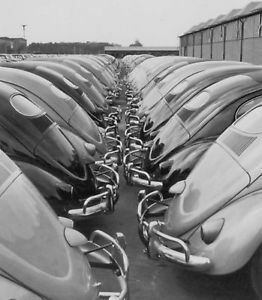 Were you one of them? 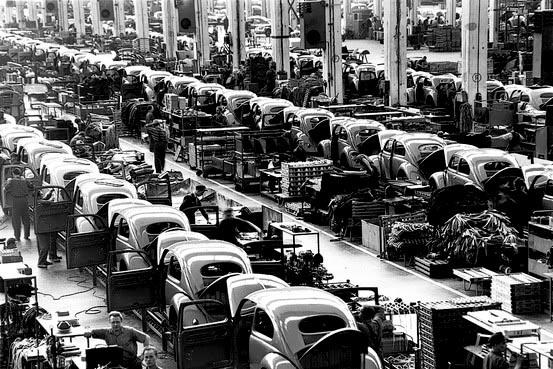 Journal Is a Reproduction Ever Acceptable? 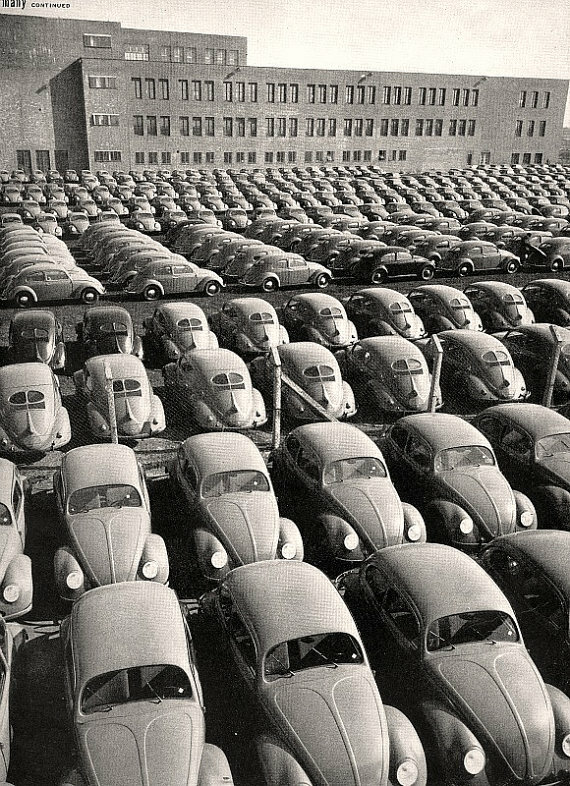 What’s the story behind the picture on the left hand side of the second to last row where there are rows of Beetles parked but some (all?) 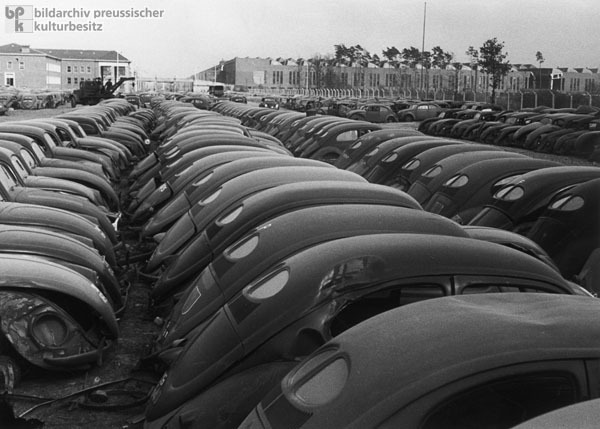 have damage? 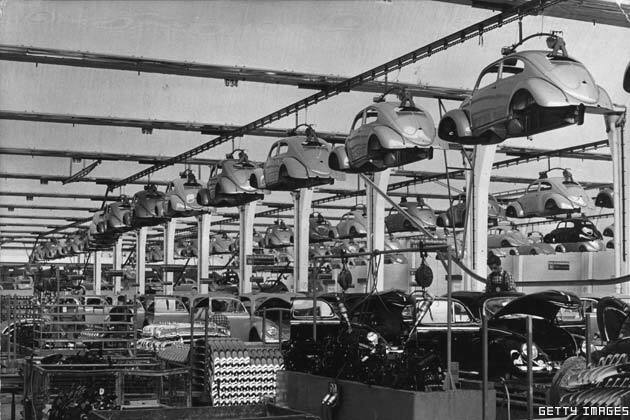 Are those factory rejects or crash tests? 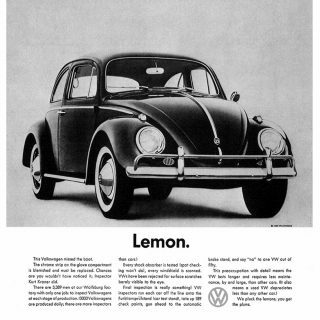 An important fact has not been covered in this article. 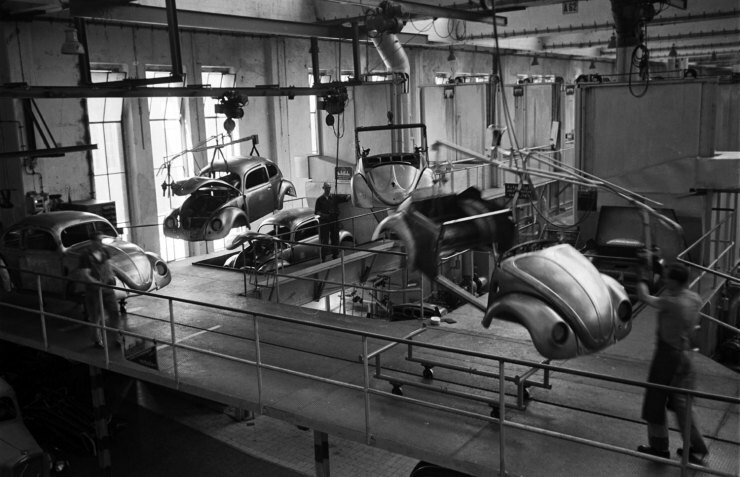 Enslaved human beings of mainy Jewish decent, from all over Europe, worked night and day to produce this vehicle. 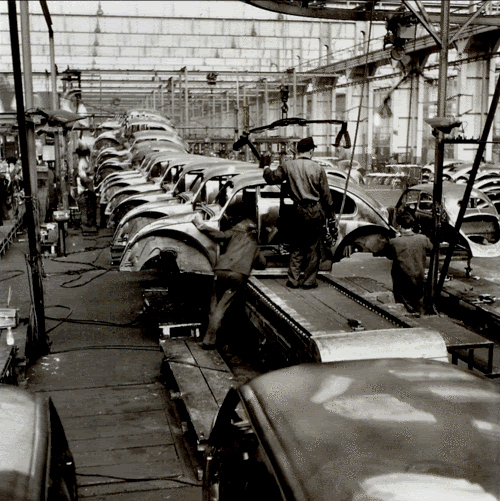 These people deserve our respect and their memory should be acknowledged whenever possible. 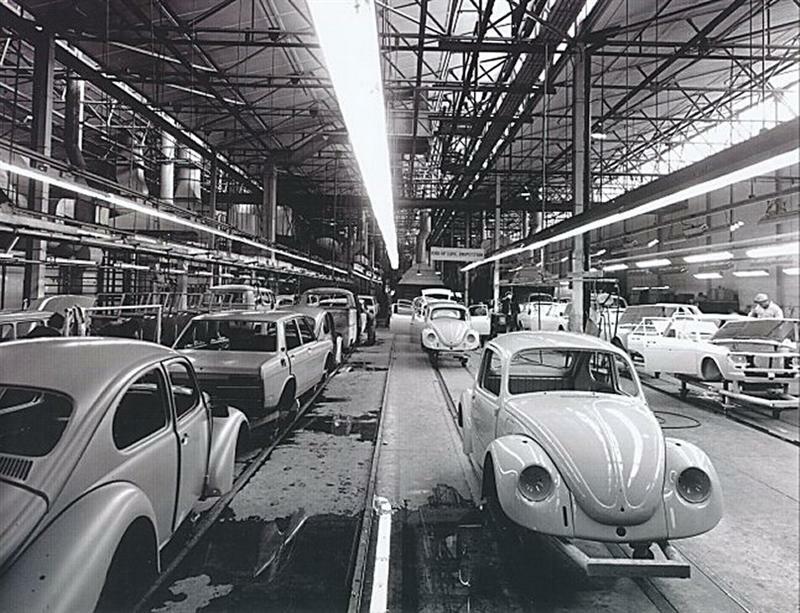 Always liked the Beetle! 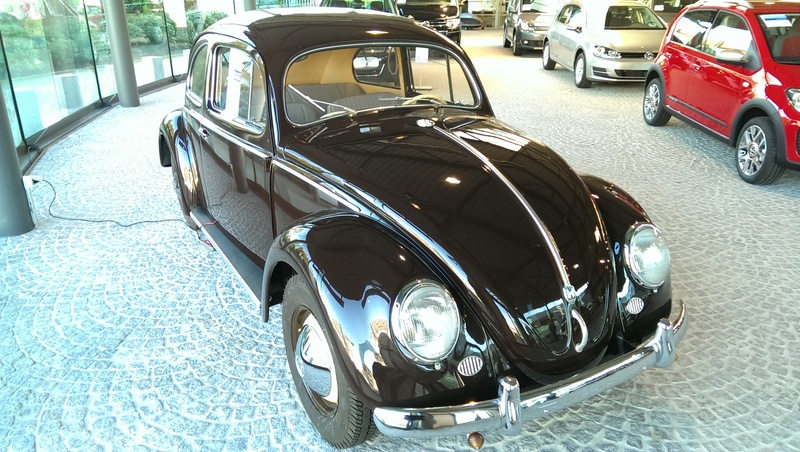 Actually fell in love with a beautifully restored and mint condition 1953 VW Beetle at my local dealership. 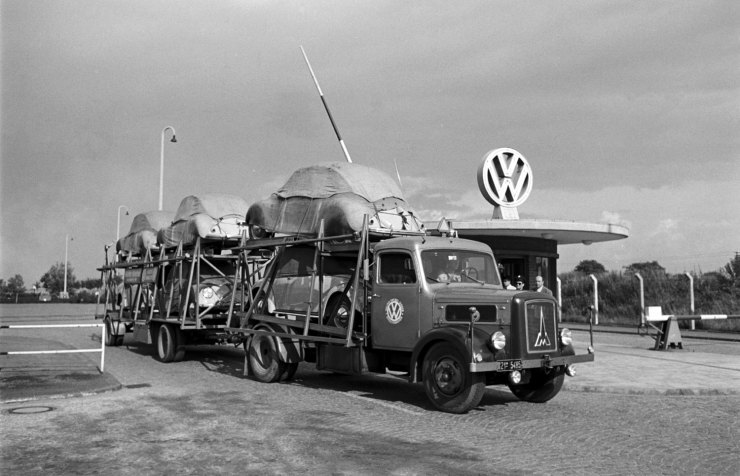 Beats modern VWs by miles! 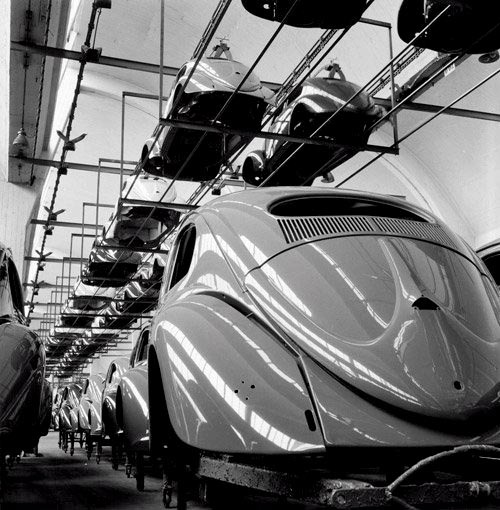 Some great archive shots here. 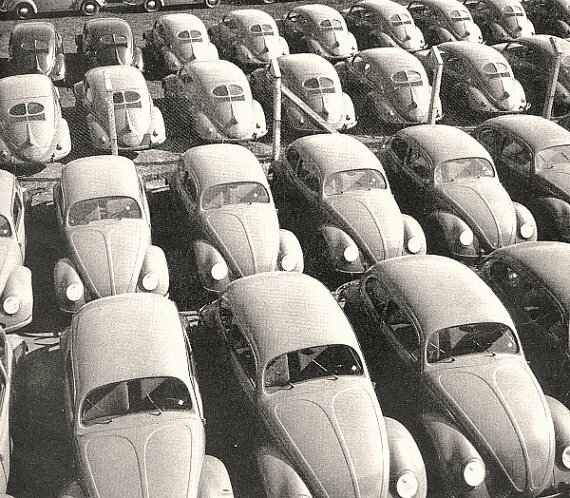 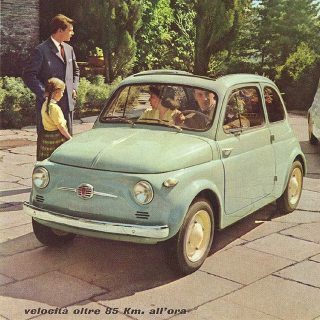 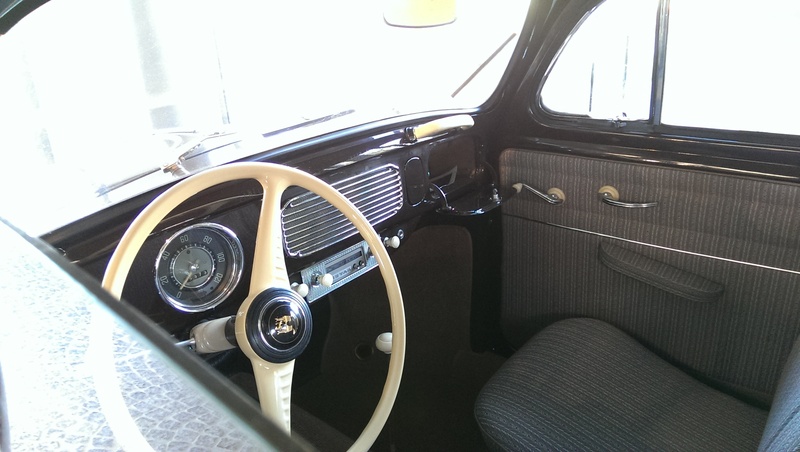 Does make you wonder how many in those images are still around somewhere today – sadly, probably not many in the case of the split-window versions. 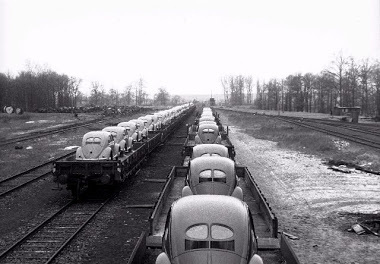 Don’t see any 1303s there so my old car certainly isn’t on show. 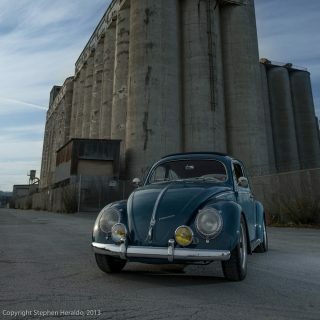 Will certainly own another Beetle at some point.